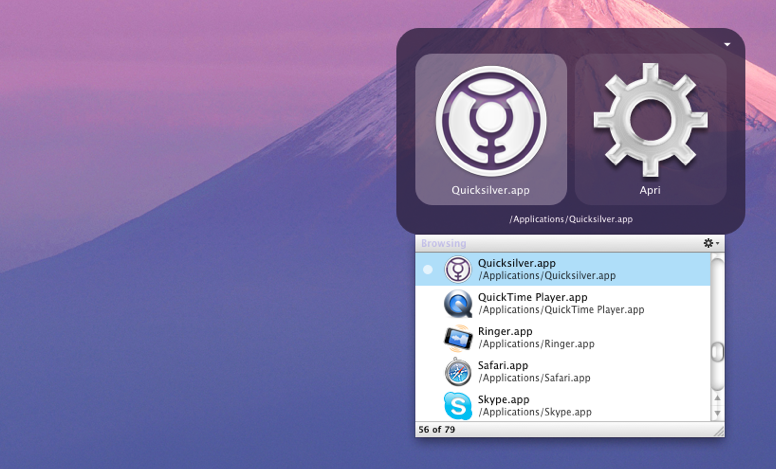 Quicksilver, the greatest mac app of all time, is back. Quicksilver might not be so familiar to new mac users but just a couple of years ago the app was considered a must for any new mac. Originally developed by Blacktree developer ‘Alcor’, it was built to speed up day to day tasks like emailing, launching apps and file manipulation but it soon grew to do far more. Eventually the development of the app was open sourced and code shifted over to GitHub. Unfortunately Quicksilver saw minimal updates and finally when the app wasn’t updated to run on Snow Leopard, many left to adopt competing apps like Alfred and LaunchBar. The app was eventually updated but still seemingly being left to grow stale despite being, at least in my opinion, better than any alternative out there. Why? I explain here but briefly: its plugins are generally of a superior quality, its truly lightweight, navigation is instinctive (after a little practice) and above all else; ‘dragging-and-dropping’ items in and out of the app is genuinely a priceless feature (you’ll need to try the app for yourself to understand and appreciate that particular feature’s value). At the end of 2010, a new website QSApp.com was launched, committed to bringing together all of Quicksilver’s scattered builds, plugins and support groups. A number of developers have been actively working on the site and the app itself and one of the people involved, Patrick Robertson, emailed in to tell us a little more about its progress. “At the moment, the main thing we’re working on is getting Quicksilver to be more user friendly. It’s always been a scary/daunting application to start off with, and we want to make it easier; nicer website, less bugs, auto update etc. But it’s not just bug fixes Robertson assures us, more features have been added such as ‘exclude file types’ in catalog searches, lots and lots of localisation (mainly German and French), optimisations for Leopard and Snow Leopard, start of 64 bit support and more. Of course Quicksilver’s features are mainly reliant on developers specifically building plugins for it. Fortunately there are a mass of existing plugins that run perfectly well with Quicksilver’s current release and new plugins are actively being developed. Whereas in the past it was left to search engines like Google to find and discover new plugins, now Quicksilver has its own plugins repo making it easy to find plugins for the app. Robertson says that people are still working on plugins for Quicksilver, such as my 1Password Quicksilver plugin, Rob’s Viscosity plugin and Remote Hosts plugin as well as updated iCal, Cyberduck, Core Support and Social Bookmarks plugins. Themes are another enticing aspect to Quicksilver. The design of the app can change dramatically depending on the theme chosen and a number of them can be found in the the same plugins repository. So what now for Quicksilver? Lets hope so because after all these years, it’s still the app I install first on any new computer and without any hesitation, the greatest Mac app of all time.